Professional women who aspire to advance their careers often encounter a sea of obstacles. Without a career playbook specific for women, many experience common pitfalls and corporate cultures that derail their ambitions, despite their best efforts. 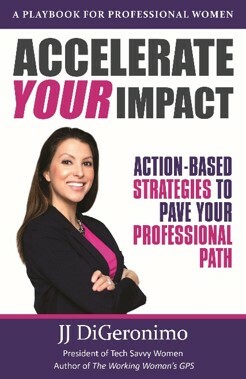 In her award-winning book Accelerate Your Impact: Action-Based Strategies to Pave Your Professional Path, two-time author JJ DiGeronimo offers high-impact women a series of proven initiatives to navigate these well-known challenges. With more than 20 years of experience in the tech industry, DiGeronimo is no stranger to navigating the twists and turns of moving from entry level to leadership positions. She learned firsthand that securing that next position, a seat on a board, or even starting a new initiative often requires women to enhance their relevance, establish new career sponsors, and expand their professional networks. In addition, personal anecdotes, examples, and stories from those who have stumbled, fallen, and succeeded provide genuine examples for professional women to maximize their career opportunities. Author: JJ DiGeronimo, the president of Tech Savvy Women, an international organization of experienced women in tech careers and organizations, began her career designing datacenter infrastructures for Fortune 500 companies after graduating with a computer information systems degree in 1995. Prior to her recent work, JJ had a 20-year career in high tech, where she positioned new technology solutions to CIOs and advanced into leadership positions within Silicon Valley-based technology companies including VMware and Inktomi. 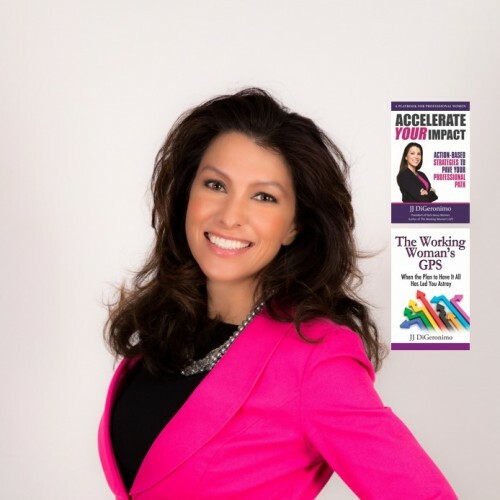 The author of The Working Woman’s GPS, JJ is recognized as a thought leader for women in tech as well as girls and STEM. She now works to empower professional women and consults with senior executives on strategies to retain and attract women in technology. JJ has been featured in many publications and TV shows including Forbes, Fox Business, ITWorld, Career-Intelligence, and Rescue a CEO. She has shared her expertise with Amazon, Ingram Micro, RIT, Sears Holding Company, Clemson University, IBM, VMware, Grace Hopper, KeyBank, and Cisco along with many other organizations.